Dr. Nancy Santagata, BS Chemistry, 2001, is currently a postdoctoral research associate in the Physics Department at The Ohio State University where she utilizes low temperature (4 K) ultrahigh vacuum scanning tunneling microscopy to tackle basic physics problems from a chemist’s perspective. I graduated from Monmouth in 2001 (yes, I shook keynote speaker Jon Bon Jovi’s hand!). Eager to continue my education in a more agreeable climate, I entered the graduate program in physical chemistry at the University of California, San Diego. As a grad student there, I utilized ultrahigh vacuum scanning tunneling microscopy at room temperature to characterize the atomic level surface chemistry of inorganic electronic materials and earned an MS degree in 2003. During my time at UCSD, Monmouth chemistry professors Marilyn Parker and Jack Richlin both traveled to San Diego, and Prof. Richlin even had the opportunity to visit my laboratory. It was a great experience to show both professors that I was able to take the concepts that they taught me at Monmouth and apply them beyond the classroom. In 2006, I entered the PhD program in chemistry at North Carolina State University. I studied the surface chemistry of a model organic/metal interface using low temperature (77 K) ultrahigh STM under the co-direction of a professor in the Physics Department, and I successfully defended my doctoral dissertation in 2009. Several Monmouth University professors are thanked in the acknowledgments of my thesis, not only for igniting and encouraging my interest in chemistry, but also for showing me that it is actually pretty cool to like (and be good at) science. 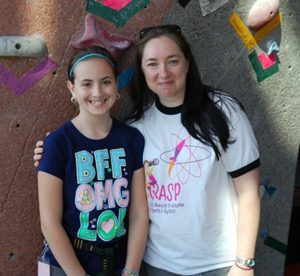 In addition to carrying out novel research as a postdoctoral research associate at Ohio State, I actively devote a portion of my time to outreach activities that aim to encourage young girls to pursue their interests in math and science. As a product of Monmouth’s supportive environment (I believe that five out of the six graduating chemists in 2001 were female), I am determined to provide the same obstacle-free opportunities for the next generation of female scientists. Recently, I gave a lecture on the physics of bicycles at the 2010 Girls Reaching to Achieve in Sports and Physics (GRASP) summer camp at Ohio State. I haven’t ridden a bike since I was in middle school, but I hope that through activities such as this I can inspire even one young girl just as I was inspired by my professors at Monmouth.